The modern screen and the tablets below it were erected in 1921 as a war memorial to parishioners who died in the First World War; they were financed by public subscription. The screen was originally intended to have a rood (Christ on the Cross – in this case flanked by His Mother and St. John) on the top but insufficient money was raised for this. The screen was designed by F. E. Howard of Oxford and the work was carried out by Messrs. Mowbray. The screen carries many coats of arms. These represent the ecclesiastical, local and regimental connections with this church. The coat of arms on the left of the west side is that of the Diocese of Bristol, and that on the right is that of Christ Church, Oxford (Cardinal Wolsey). The following photograph shows a close-up of the central section of the vaulting in the top of the screen. 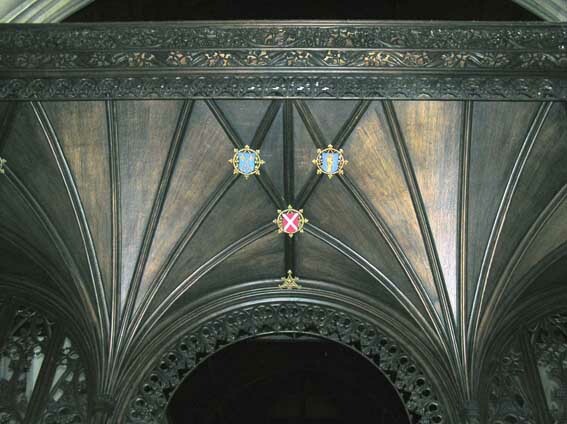 It shows the crossed keys of St. Peter (which can also be seen in the west window of the porch) and the diagonal cross of St. Andrew, albeit unusually on a red, rather than blue, background. On each side of the chancel screen (separating the chancel from the nave) at the rear of the nave altar platform is a carved and inscribed memorial to those who fell in the First World War. The two sides of the memorial are surmounted by the same inscription. Here is a list of all the names on the memorial. A study of a Chippenham street map will show that many of these men have had local roads named after them. Remember the men from this parish who fell in the Great War, 1914-1918 in whose memory the roodscreen is dedicated to Almighty God, a.d. 1921. 1. Wallace Rooke is also commemorated in a brass plate on the wall of the south aisle. 2. The three Wilson brothers are also commemorated in a stained glass window on the south side of the baptistry.